Researchers have connected a global network of radio dishes to capture the first-ever image of a black hole. The Event Horizon Telescope (EHT) project and the National Science Foundation (NSF) held a press conference on Wednesday, April 10, 2019, 9 a.m. EDT (April 10 at 11pm AEDT) to announce the findings. Here's what the experts had to say. WASHINGTON - The Event Horizon Telescope (EHT) — a planet-scale array of eight ground-based radio telescopes forged through international collaboration — was designed to capture images of a black hole. This is really exciting because it is the first time we have got a clear look at a black hole. The black hole’s event horizon is where the laws of physics as we know them break down. Studying this region is crucial to understanding what goes on inside a black hole, what happened at the moment of the Big Bang, and the deeper underlying laws of nature. But this is just the start. The image is still pretty blurry. It’s like looking through frosted glass. As we work to make our telescopes get bigger and more powerful, we can expect many more exciting images and discoveries to come. The image that you see of the supermassive black hole comes from material that has teetered on the brink of a supermassive black hole. This material emits millimetre radio waves, that reach telescopes on Earth after a journey that took 55 million years. Collecting and analysing these radio waves is a challenging task and these remarkable images are a testament to how human curiosity about our universe, and our ability to collaborate, can be harnessed to do incredible things. The new challenge will be to interpret what has been observed, and to investigate how the new knowledge we have gained fits into our current understanding of how black holes work. The images synthesized from the data obtained by the Event Horizon Telescope collaboration for the first time show the black hole shadow surrounded by the bright light ring, the key signature of black holes predicted by general relativity and a variety of other ultra-compact objects that are produced in more or less exotic models. That means that now we know that the black hole candidates are true ultra-compact objects. Now the race begins: there are many reasons to suspect (and Hawking’s works were one of the primary motivations) that what is inside is not a black hole, and many arguments why it can or should be. Now the game to find out what is in the shadow truly begins. The result is an outstanding achievement and certainly provides the strongest direct evidence for the existence of (Kerr) black holes. The result makes use of a technique called Very Long Baseline Interferometry (VLBI) which connects radio telescopes over long distances to increase resolution. This is not a new idea, in fact, it is one of the oldest tricks in the book. Nature and evolution long ago worked out that it was better for humans (and other animals) to have two eyes (separated by some distance) rather than one central eye, to help us see further and catch prey. This is an extremely significant result. Astronomers have been talking about observing black holes for years, but this is the first image with enough resolution to actually resolve the Schwartzchild radius - the radius of the event horizon. General relativity (GR) of course predicts black holes and there are a variety of observations in astronomy that are explained by black holes, for example, the high-energy activity seen in the centre of galaxies. Motions of stars in the centre of our galaxy show the presence of a compact massive object, and the orbits show general relativistic effects. In fact, astronomers take the existence of black holes pretty much for granted. However, we have never had an actual image of the event horizon of a black hole, the existence of which is a key GR prediction. Maybe gravity is different from GR in these extreme strong field regime and we get something different to a black hole but which still is massive and dark and looks the same at large scales? These observations demonstrate that the event horizon exists in the monster black hole at the centre of the galaxy M87. What is actually seen is a ring of light, caused by the gravity of the hole bending light around it at the scale of the horizon, and this ring can be compared with detailed predictions from GR - which one of the papers does! I expect future work will compare this data with non-GR models now we have the capability. I believe it is the highest resolution image ever made, it uses the technique of 'Very Long Baseline Interferometry' where radio telescopes all across the earth have their signals electronically combined to make a virtual telescope with a resolution equivalent to one the size of the Earth. However, it does this at super high radio frequencies (230 Ghz) which gives even higher resolution. This is technically challenging, and you have to combine a lot of telescopes to get a decent image, and this is the first time that has been done. M87 is 50 million light years away and the event horizon is only the size of our solar system. (The radius is about 3x Pluto’s orbit). This has been an exciting few years for black hole science! First, we discovered the first gravitational wave signals from monster black holes merging, and how this exciting image! It is a fantastic time to live through. We have been expecting these results from the Event Horizon Telescope project for a year or two now, next we will see the more technically challenging observation of the black hole at the centre of our galaxy. This is more challenging because the gravitational timescale here (time for matter to swirl around the hole in a final orbit) would be less than a minute, compared to a day for M87. This complicates the analysis but on the flip side if this can be done we may look forward to seeing a cool movie emerging especially if the telescope is able to capture the black hole consuming a large chunk of matter being consumed in real time! We have had good evidence that black holes exist for a long time. We have been observing their effects on the motion of the stars around them, and the way they warp spacetime as they collide. This is the first time we can see the light swirling around the event horizon of a black hole right before falling into it, never to be seen again. It’s this evidence of light being removed from the Universe that is so amazing. [Pre-press conference comment:] The only black holes anyone has seen so far have been works of fiction. We have watched movie heroes battle with the immense gravitational attraction of giant black holes, but what do these black holes really look like? With my team, I am hunting for black holes that grow and these are ablaze with light. But most black holes in the Universe are dormant, such as the one at the centre of our own Milky Way galaxy. All we can hope to see is their shadow in the darkness of space – that strikes me as one of the hardest pictures to take, ever. The Event Horizon Telescope team have worked for years to construct a picture of these two black holes, which are the two easiest ones to image. I very much hope this is only the beginning, because there are billions of giant black holes out there, one in the centre of every galaxy. [Pre-press conference comment:] This image is going to be the most visually direct image of a black hole so far. There’s been a long-standing challenge to capture an image of a black hole’s immediate surroundings – the region around its event horizon, from inside which no light or other electromagnetic radiation can escape. What we will see is the absence of background radiation where the supermassive black hole is and a ring of light around it caused by stars and gas falling into the black hole and creating huge amounts of friction and heat. Depending on how sharp this image will be, the detail of the black hole’s shape and the distortions of gravity it produces could offer a test of Albert Einstein’s theory of General Relativity. This theory, one of the most extraordinary scientific achievements of the 20th century, explains that the force of gravity arises from the curvature of space and time. This new black hole image could confirm whether Einstein was right or whether we need to revisit this theory. The Event Horizon Telescope is working at a radio wavelength of 1.3mm, a very short wavelength in the context of radio astronomy. The shorter the wavelength, the sharper the image, so we can hope to see very fine detail in this first-ever image of a black hole. [Pre-press conference comment:] Black holes are some of the most fascinating objects in the Universe. In the past few years, we’ve made great progress in understanding these objects. And today we make another big leap – being able to see the effects of a black hole. The direct image of the event horizon is amazing. It allows us to directly measure how black holes affect gravity and time. I never thought we would be able to see something that has been so mysterious. [Pre-press conference comment:] The observations with the Event Horizon Telescope may provide crucial information on the way in which the interactions of black holes with surrounding matter produce energy. This is relevant to all black holes in the Universe. The observations may also tell us the way in which jets moving close to the speed of light are accelerated away from the black hole, as well as improving our understanding of the composition of plasma which is ejected from the black hole environs. Astronomers have successfully observed the invisible. An enigmatic monster of the Universe has just been imaged. The self-created cloak of invisibility around the black hole has betrayed its presence. A 55 million-year-old photo of a spinning black hole 6.5 billion times the mass of our Sun. Having spent years studying the influence of these previously unobservable objects, it feels like a validation. Observationally confirmed a quarter of a century ago, this shadow of a black hole removes any shadow of a doubt as to their existence. Outflows from these massive black holes shape the galaxies upon which they feed. This has driven global research into black holes for over 20 years. At Swinburne University, we have studied these connections and interplays in over 100 galaxies with directly measured black hole masses. Their existence has now been further confirmed by this beautiful fuzzy ring showing the silhouette of a black hole. We have studied and dissected images of these galaxies, using infrared images from the Spitzer Space Telescope. This photon ring illuminating a black hole's event horizon also provides the world with an undeniable ring of truth to Einstein's theory which told us over 100 years ago how our Universe operates." "Observing the hole in this supermassive doughnut is a testament to humanity's scientific capacity. To have dreamt up the existence of black holes in the 1700s, confirmed their reality a quarter of a century ago, and now imaged the ghostly silhouette of one, is truly remarkable. Furthermore, from an engineering standpoint, what has been accomplished is akin to seeing a pinhead from ten thousand kilometres." In an extraordinary feat of science and engineering, astronomers have attained an image resolution equivalent to observing a pinhead at a distance of ten thousand kilometres. They have achieved this by effectively linking many of the world's radio telescopes with the intent of seeing the first-ever silhouette of a black hole. The upcoming announcement from the international Event Horizon Telescope (EHT) team is expected to show the dark face, the so-called "event horizon", of our Milky Way galaxy's central black hole, with a mass four million times that of the Sun. While this black hole is located 240 million billion km away, when feeding, such supermassive black holes can influence their entire galaxy. The results are expected to provide further confirmation of Einstein's theory of relativity, famously known for distorting space and time, no doubt also happily along with the minds of many science enthusiasts and science fiction fans. Although black holes were confirmed to exist from observations a quarter of a century ago, the anticipated radio image should be able to see detail just three times the size of the black hole's event horizon - the infamous boundary marking the point of no return. This close to the gravitational prison, from which not even light is fast enough to escape, Einstein's astonishing general relativistic effects should be apparent, revealing the shadow of the black hole. The power of the human spirit to predict, discover, and then directly observe the invisible face of a black hole is a remarkable achievement. This was an amazing technical feat – to make it work, the EHT team used radio telescopes that are thousands of kilometres apart and lined up the signals they receive to around a millionth of a millionth of a second! When they do, they’re able to make phenomenally sharp images – if your digital camera was this good, you could take a photo of a person hundreds of kilometres away and make out individual strands of hair on their head. They used this capability to capture the shadow that a supermassive black hole casts – it’s the first time astronomers have ever really “seen” a black hole. When you think about it, the photons that travelled almost 60 million years to hit the EHT telescopes in 2017 and make this image were extremely lucky – they were born right next door to a monstrous black hole and nearly, nearly fell in. The shadow we see in the image is the absence of photons right next to them that weren’t so lucky, they fell over the black hole’s event horizon and no-one will ever see them again. "I have previously been a co-author on a couple of papers with some of the authors of these papers, on some semi-related work (millimetre images of the black hole in the middle of our galaxy). Also, I developed some of the instrumentation that was used in part of the data analysis in this work (the DiFX software correlator) so I got an acknowledgement at the end of their papers for that. I don't personally consider either of these to be a conflict, as I'm not involved with these sub-millimetre observations at all, but thought I should mention it." It was hugely exciting to see the fantastic results from the Event Horizon Telescope. Using a network of radio telescope around the Earth and incredibly precise interferometry, the EHT team imaged the central black hole in the galaxy M87, more than 50 million light years away. Their image matched the predictions of Einstein's general theory of relativity: in the image of radiation from a disk of matter spiralling into the black hole, this supermassive black hole itself casts a gargantuan shadow. The size of the shadow has been used to get the most precise measurement of the black hole's mass: a whopping 6 billion times the mass of the Sun. It's a monster, but a very law-abiding one, precisely following the rules laid out by general relativity. The Event Horizon Telescope (EHT) project has just released the first direct image of material disappearing across the event horizon of a supermassive black hole in a galaxy approximately 55 million light years away (one of our closest neighbour galaxies). The EHT is composed of a collection of radio telescopes operating at very high frequencies, scattered around the world, generally in remote and high elevation locations, posing very challenging problems in engineering and data processing to effectively build a telescope with a diameter equal to the Earth's diameter. This is an astonishing result, obtained in record time, built on international collaboration and multi-disciplinary efforts. There is clearly lots of room for improvement and I expect we will see in the near future even better images from the EHT, uncovering more of the mystery of black holes. The Event Horizon Telescope (EHT) is a network of radio telescopes around the globe, whose data are synchronised precisely so as to function as one “virtual” telescope the size of our planet. The imaging resolution possible with the virtual telescope is absolutely mind-bending. Capturing an image of the black hole shadow is like standing in Sydney and imaging a flea in Perth. The image of the supermassive black hole in the centre of M87 is stunning and looks just like simulations predicted, meaning that Einstein’s theory passes yet another test. The dark shadow we see is actually almost three times larger than the black hole, because light rays along our line of sight get funnelled in by the extreme curvature of spacetime near this giant. We can beautifully see that the hot gas falling onto the black hole is brighter on one side of the shadow than the other – this is because it is travelling near lightspeed and confirms predictions of Einstein’s general relativity. This hefty black hole weighs in at 6.5 billion times the mass of our Sun, and is the size of our Solar system. For decades cosmological models have predicted black holes, and black holes have been validated over and over again with indirect evidence. So it's easy to lose sight of the fact that - until now - we've never actually seen one. But the Event Horizon Telescope has peeled back the curtain and given us our first direct image of an event horizon - the boundary in spacetime that wraps a singularity - the boundary at which, once passed, nothing can ever leave. And we've got it on picture. Lying in the heart of supergiant galaxy Messier 87 is a supermassive black hole dwarfing anything inside the Milky Way, a black hole more than six billion times the mass of our sun. Surrounded by a fiery maelstrom of infalling matter over a hundred billion degrees in temperature, we see the event horizon, a region of deathly calm in the most chaotic region of space ever imaged. This black hole allows us to measure Einstein's General Theory of Relativity in the drastically curving region of spacetime around an event horizon, and Einstein's Theory passes yet one more test with flying colours. Richard de Grijs is Professor of Astrophysics at Macquarie University and Associate Dean responsible for the global engagement of its Faculty of Science and Engineering. The technical challenges were formidable, but that didn’t stop an international team of more than 200 scientists to link together essentially all existing submillimetre telescopes – as far south as the South Pole – to create a virtual telescope the size of the Earth. Today represents indeed an historic moment: it marks the confirmation that black holes exist and that support for Einstein’s theory of general relativity is as strong as ever. This could only have been achieved by collaborating internationally, by putting science on a pedestal irrespective of political, religious or other controversies. Once again, this team has proven that science diplomacy is a viable means of bringing people together to work on common goals while overcoming numerous challenges against almost insurmountable odds. An international team of astronomers have, for the first time, peered into the heart of a black hole, imaging the dark region corresponding to its event horizon—the point from which light can no longer escape. With a mass 6.5 billion times that of the Sun, this black hole has an event horizon roughly the size of our entire solar system. Located at a distance of 55 million light years, the magnifying power of the telescope required to see the black hole's shadow was the equivalent of being in Perth and reading the writing on a coin located in Sydney. The image confirms that black holes do have event horizons as opposed to dim but solid surfaces, and was in full agreement with predictions from Einstein's theory of general relativity, allowing this century-old theory to pass yet another rigorous test with flying colours. This new measurement is proof that a black hole is indeed responsible for launching such energetic jets, which in other, more distant galaxies, are known to shape some of the most massive structures in our Universe. Astronomers have been accumulating evidence for black holes for almost half a century. The simplest explanation for quasars and certain X-ray binary stars is that they are powered by black holes. We can see stars zipping around an unseen mass at the centre of our own galaxy, and we similar evidence of stars and gas orbiting vast unseen masses in other galaxies too (including Messier 87). The creation of black holes produces gravitational waves, which were observed for the first time just a few years ago. This intriguing image of Messier 87’s black hole may not be as impressive as its CGI cousin from the movie "Interstellar.’’ However, it is consistent with what theoreticians have been expecting. We can see a ring of light around a circular shadow, the result of luminous plasma near the black hole moving at close to light speed and light being deflected by the black hole’s vast gravitational pull. Professor Lisa Harvey-Smith is an astronomer at the University of New South Wales and Australia’s Women in STEM Ambassador. As someone who has studied the environments of supermassive black holes, this long-awaited result from the Event Horizon Telescope is extremely exciting. 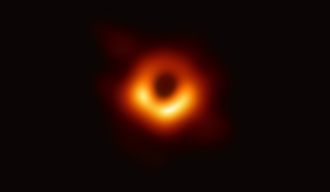 Although we have been able to measure the properties of supermassive black holes before, this is the first time that we have seen a picture of the light from their very edges. This research is particularly important because it has the potential to test Einstein’s theory of gravity to the limits. What is the event horizon? This is the boundary around a black hole inside of which nothing can escape, not even light. This was predicted by Einstein but has never been observed. The nearest black hole, 4 million times the mass of the Sun, is at the centre of our Milky Way galaxy, and the orbits of stars close to the black hole have been mapped at infrared wavelengths for more than a decade. At this time of year, the centre of the Milky Way is high in the sky in Australia in the early hours of the morning. This is the target of the Event Horizon Telescope (EHT) and its observations will be reported in simultaneous world-wide press conferences on 10 April. An image of the region of sky around the black hole, known as Sagittarius A*, has been made at a frequency of 86 GHz (or a wavelength of 3.5 mm) using the combined power of radio telescopes in Chile, Mexico, Arizona, Hawaii, Spain, and the South Pole. The image will have the resolving power of a telescope more than half the diameter of the Earth, but has it seen the shadow of the event horizon? The worldwide near-decade long experiment is nearly as epic as the prize itself - an impossible picture of a black hole. Just imagine if the picture isn’t what we expect, a new era of astrophysics could be revealed! If the picture is as predicted then Einstein was vindicated in a way he couldn’t conceive of being possible a century ago. The first image ever taken of a supermassive black hole - M87, at the centre of the Virgo A galaxy.